What a pleasure and privilege to encounter two Faust legends in close succession: after the recent glorious Boito Mefistofele from Chelsea Opera Group less than a month ago (review click here), here was Gounod’s famous take in David McVicar’s staging, in its fifth revival under Bruno Ravella. If the cast of this revival was less stellar than in 2011, when Méphistophélès was taken by René Pape, Valentin by the much-missed Dmitri Hvorostovsky and Marguérite by Angela Gheorghiu, the 2019 cast was still immensely strong. Which is surprising. Read on. The role of Marguérite for this revival was due to have been taken by Diana Damrau, herself a replacement for Anna Netrebko. Damrau pulled out, so Russian soprano Irina Lungu was scheduled to perform. A throat infection and a fever meant Lungu was unable to take the role, so flown in, on literally just a few hours’ notice, was young German soprano Mandy Fredrich. Was this some Mephistophelian curse at work? Making her Salzburg Festival debut in 2012 as Queen of the Night (Die Zauberflöte), Fredrich has sung Donna Anna (Don Giovanni), Fiordiligi (Così) and Marguérite – in fact she also made her Vienna State Opera debut in this latter role. This is quite some way to make one’s Royal Opera debut (for such this was), and she performed magnificently. Apparently, she was coached in the production on the journey from the airport: the stuff opera stories are cut from. To boot, it was announced that Erwin Schrott had a similar if less acute malady and would soldier on, but asked for our indulgence. Not that much indulgence was needed, as it turned out. McVicar’s production continues to intrigue and thrill. Charles Edwards’s sets put a church organ loft to the right, a theatre box to the left, while McVicar includes a risqué ballet and a ‘Cabaret l’Enfer’ complete with high-kicking girls – a special mention for the male and female principal dancers, Yasset Roldan and Megan Griffiths respectively; huge character from both. What’s not to love? A figure of a crucified Christ looms large before it is desecrated, a similar journey from sacred to secular, or a representation of the internal tussle between the two. 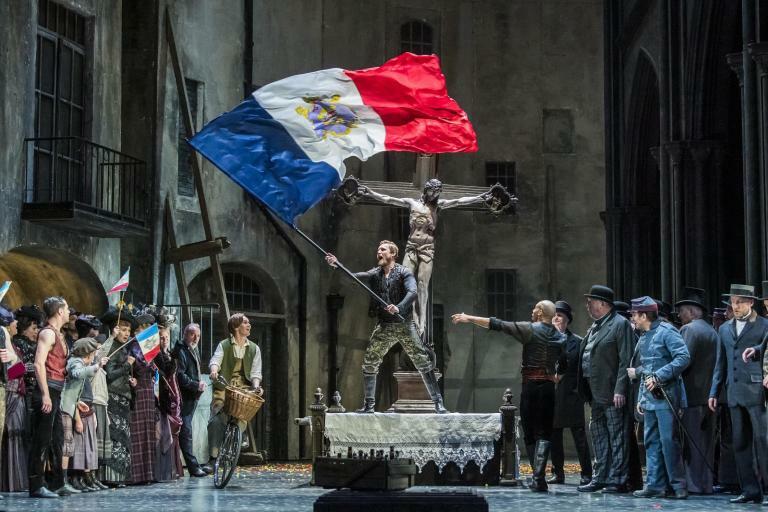 In this production the action is set in Paris in the early 1870s, as opposed to a German town during the sixteenth century, the intent being to draw parallels between Gounod’s experiences and Faust’s. Gothic to its core, McVicar’s staging requires a number of fast and significant scene changes, managed expertly on this first night. We actually finished a tad before the scheduled time, something aided and abetted by Dan Ettinger’s fast, but not rushed, speeds. The orchestra responded with much sparkle and Gallic charm; just the very occasional blip between chorus and orchestra belied the performance’s first-night status. Before we get to the Marguérite, a word for the wonderful combination of Faust and Méphistophélès on this occasion, as their voices seem to be made for each other, their sound made more proximate because of a certain baritonal quality to Fabiano’s tenor. Erwin Schrott owned the stage as the Devil himself, his ‘Chanson du rat’ an absolute joy (underscored by acute reactions from the orchestra). It is precisely the same swagger one would associate with that Mephistopheles wannabe, Don Giovanni. Fabiano’s big solo numbers were entirely convincing, his ‘Salut! Demeure chaste et pure’ a particular highpoint, his voice strong and expressive. Mandy Fredrich made an absolutely charming Marguérite, her voice fresh. (What plane? What panicked taxi ride?) Her demeanour was absolutely convincing as an innocent girl caught up in such infernal pacts. Her ‘Il était un roi de Thule’ was lovingly told, her vibrato perhaps projecting a certain fragility of her character and certainly well-judged. Her voice was beautifully free right to the very end of the opera. Stéphane Degout was a superbly creamy-voiced Valentin, his ‘Avant de quitter ces lieux’ a miracle of legato. A name new to me, British-Spanish soprano Marta Fontanals-Simmonds was a fine Siébel, her ‘Faites-lui mes aveux’ a joy. British soprano Carole Wilson’s Marthe Schwertlein was delicious, a lovely foil for her Marguérite, comedic in her loss of control over her rampaging hormones, while Germán E. Alcántara is a strong Wagner. The Royal Opera Chorus was on glorious form throughout. A magnificent evening, and a triumph against the odds. It was a privilege to experience music-making of this caliber.